The best things are always worth fighting for. For the past several days, I’ve been fighting. 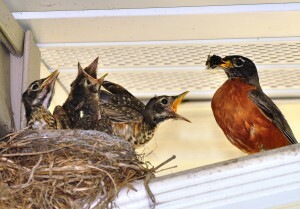 Fighting with deer, fighting with robins, fighting with catbirds. We’re fighting every day. Fighting at breakfast, lunch and dinner. Perhaps competing is a better term. My – or maybe I should now say our — favorite stands of wild mulberries have reached full maturity, and it seems that everything wearing feathers or fur is currently after their fair share. Mulberry trees are wildlife magnets. Few wild edibles are more popular or occur in greater abundance. 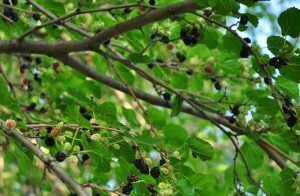 Unlike other wild fruits or berries, mulberries produce several summer crops in rapid succession. 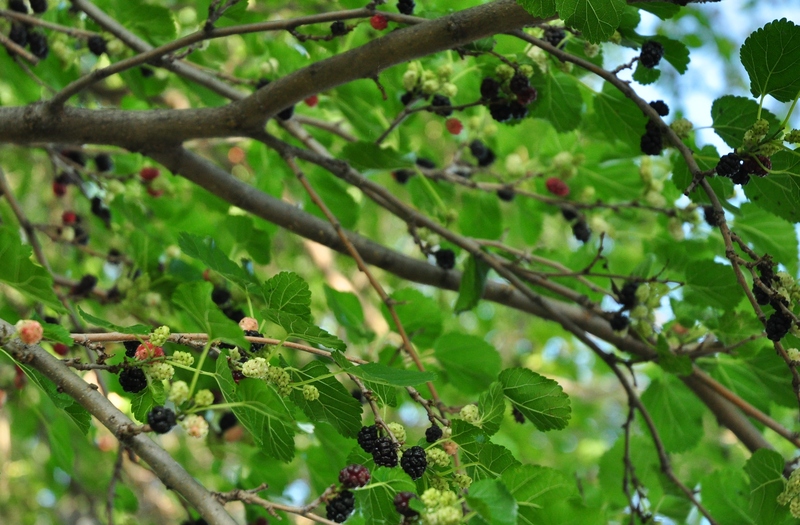 As healthy as they are tasty, mature mulberries pack a nutritional wallop. A single cupful contains 60 high energy calories: a combined punch of 11 grams of unprocessed sugar and 14 natural carbs – more than enough fuel to make berries worth gathering for birds, deer or people. Although one of my favorite spots only contains two trees, it’s more than enough to attract berry eaters from far and wide. Most of the birds use the trees as a fast food drive-thru, grabbing a plump berry and then carrying it back to their nest to feed hungry nestlings. 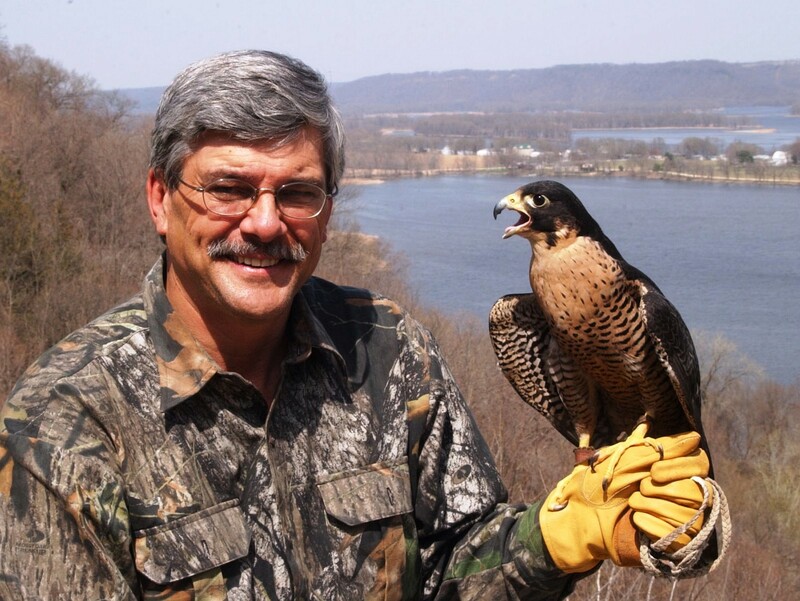 Regardless of species, the birds are a solo act; coming and going as singles. The deer are different story. They arrive in pairs or in small herds containing up to five or six individuals. 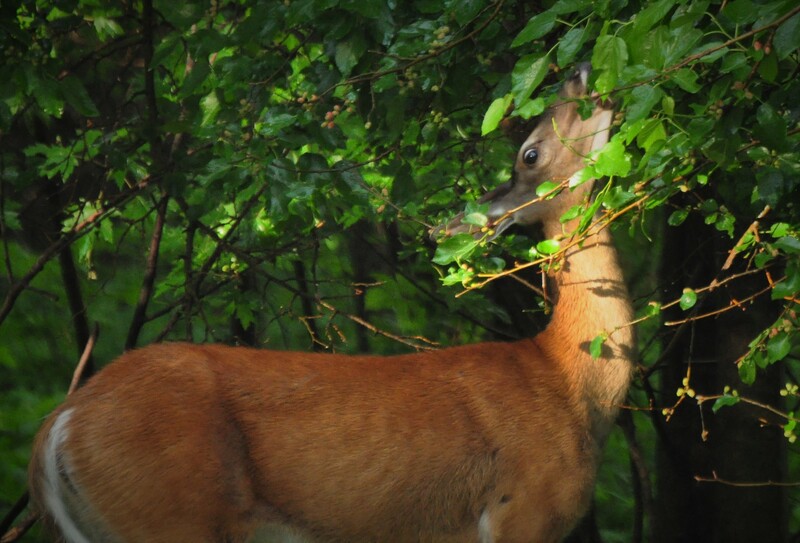 Instead of eating their berries one at a time, white-tails guzzle them by the gallon. Deer are my greatest mulberry competitors. Human competition is rarely a factor. During the past several years, I only know of one other person who has collected from the same woods. Not surprising. Most members of our electronic addicted, hyper-urbanized culture can walk right by a mulberry tree and not even recognize it as food. Those who can identify the species either ignore it completely or regard it as a nuisance because of all the berries it annually produces. Nuisance? Yup; I’m not kidding. 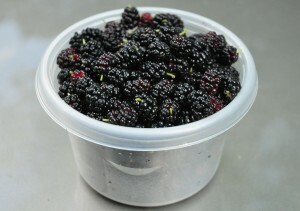 As they grow in size, mulberries turn from light pink to purple to black. Berries reach their sugary perfection when they become shiny and jet black. At this stage, the fruit is so ripe that giving berries a good stare will bring them down. That’s an exaggeration, of course, but not by much. 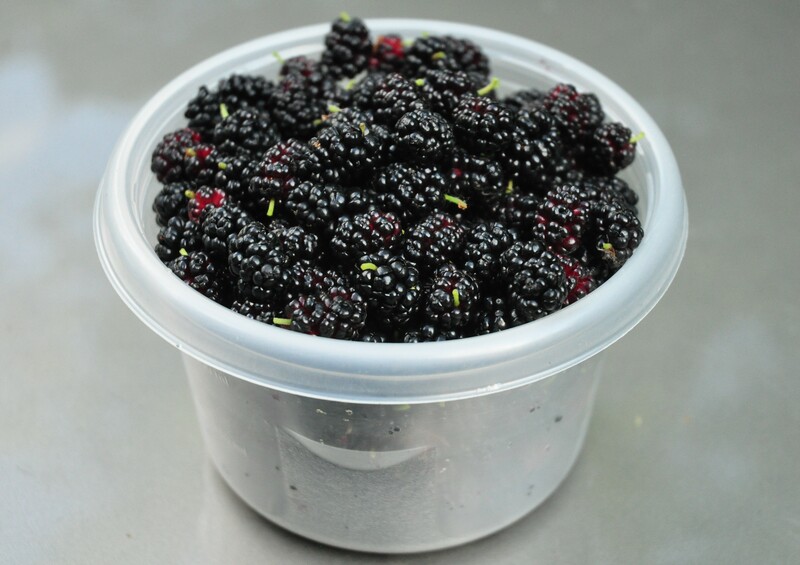 Anyone who’s harvested mulberries knows what it’s like to reach for one berry and have a half dozen of their closest neighbors fall to the ground. Local deer populations are also aware of this phenomenon. I’ve watched deer clamp down on the end of a fruit loaded branch and then shake it vigorously. Ripe berries rained to the ground as everyone eagerly partook of the feast. When the berries were gone, the shaking was repeated on another branch. 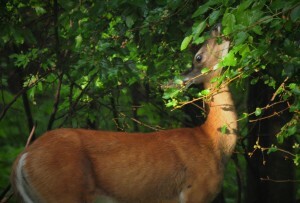 Regardless of how many times the routine occurred, it was always the same doe who supplied the berries. I’m not sure whether that put her at the top, or at the bottom, of the group’s pecking order. I realize that I might have sounded a bit crotchety at the beginning of this column. In reality, I really don’t mind sharing “my mulberries” with each and every creature who enjoys their goodness. Widespread and plentiful, the mulberry is a wild edible that produces in such abundance that there is always more than enough for everyone. Even when we’re only talking about a couple of trees.